Oh happy day -- tradewinds and sunny skies are back! The winds were light and smooth yesterday, and all of our windward flying sites were beckoning. I managed to convince Don to pack up his wing and come out for a hike up the Punaluu ridge, to see if the wind was blowing northerly enough to allow us to cross the bay. Mad Dog didn't need any convincing to come out there, although he did grumble a bit about not using the normal launch ridge. We launched from the low flank of the Punaluu ridge into a nice northeast breeze, and after getting high enough to start, I crossed the bay with room to spare, followed shortly after by Mad Dog. But Don found himself struggling to get enough altitude to make the attempt, maybe because his new wing is a lot smaller, or because the wind might have slacked off a bit. I was worried: it's harder to enjoy a special flight like this when one of your buddies is left behind. But I have to admit I was enjoying it a little. 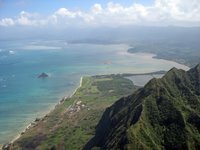 As Don made one or two unsuccessful attempts to cross over and join us, Mad Dog and I flew all over Kaaawa and Kualoa. Cloudbase was high and the lift was plentiful and smooth. We noticed that the recent rains and floods have left their mark on the landscape we were flying over: the ridges are streaked by numerous new mudslides, and we could see massive underwater formations of runoff silt at the mouths of all the streams. I had to leave early to pick up Amelia, so after a while I reluctantly returned from Kualoa to rejoin Don, who was just getting high enough to begin a successful crossing attempt. I was very happy to see him making it across, even if I couldn't be over there at the same time. I set up for a landing in Punaluu, on the beach in front of Quentin's brother's house, where we have our wind sensor installed. It was a little tricky to get in there, with all the palm trees leaning out over the beach, but I made it work this time, to the surprise and delight of Q's brother-in-law who came out to watch. I folded up at the Punaluu Restaurant, and walked the 10 minutes back to the car at the trailhead. After I left, Mad Dog landed at Kualoa and caught the bus back to his car, and then he went to pick up Don, who had stayed up for as long as possible over Kaaawa and Kualoa, finally coming down for a landing at Swanzys to grab some cold refreshments. On my way back from town, Amelia and I met Don and Nightshift in Kaneohe for a nice Mexican dinner, to celebrate the return of good flying weather. The conditions were so nice that we could have probably flown at any of a half dozen sites. On days like this it can be tough to know which site might offer the most rewarding flight. But sometimes you just have to go with your gut, and make your best call. I'm pretty sure we got it right this time. I flew at Makapuu in the Funky, Jetflap was already leaving when I was driving up. The conditions were quite strong and NE and the LZ was amid the turbulence from Rabbit. The air wasn't as smooth as you guys reported but it was a perfect direction for making low passes over the beach. Late day fun! Makapuu was fun, even though quite strong. I spent about 45 min flying with Hangi's Mike Benson and Brandt in the bowl. Burnt it home afterwards, blowing by Fireman on his way out. I heard Mad Dog and Don on radio while I was flying, although they could not seem to hear me. Good fun for all. Still, I think bay crossings and other XC stuff will be good prep for the RR, so I hope to be giving it a go, albeit cautiously! Sandy, we were definitely very aware that the beach at Kahana was NOT an option if we found ourselves low as we crossed. This basically means that you turn around higher than normal, maybe 1000 feet instead of 600. Because you HAVE to go back over a mile of water AND get back up over there. Also I should point out that the landing options aren't nearly as good in Punaluu as at Kahana. The closest beach, in front of Quentin's brother's house, across from the Punaluu Restaurant, is not that wide, and there are lots of palm trees leaning over the beach. Sometimes in the past we have landed further downrange on the beach in front of Ching's Store at about the midpoint of Punaluu Valley. The beach there is a lot wider, but still not nearly as good as Kahana was. But at least there are cold refreshments available across the street. Another point to consider is that the bomb-out LZ (the nearest pastures behind the Punaluu Restaurant) is not visible from the Punaluu ridge, nor is it easy to reach unless you head straight there without sinking much first. I've hit it before, downwind, and it was an interesting experience I would prefer not to repeat. So basically the flying from the Punaluu ridge site is a lot more demanding than it was at the Kahana site. I would say on a day that's moderately strong, everyone would be fine, and most folks should consider landing near Ching's store and getting a ride back. Unless you have XC ambitions in either direction, in which case there are lots of nice landing options.